This Missoula 3-car garage got a complete garage makeover. First we applied the direct to concrete epoxy flooring system using ¼” Graphite flake with two coats of our 5108 Industrial Strength Polyaspartic. We even coated the 6-foot-tall foundation walls. After installing Red cabinets with Black channel pulls, we installed Charcoal slatwall with Black 6 inch fillers to match the Black channel pulls. 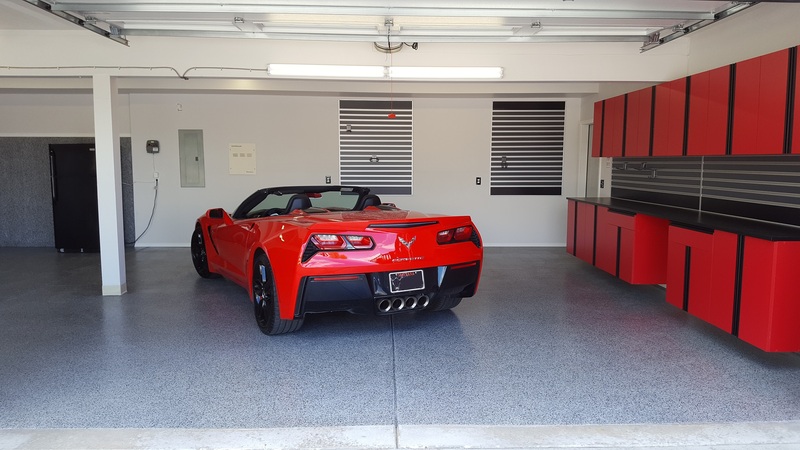 Now the garage looks good enough for this beautiful Corvette live in.